Acrylic elastomeric waterproofer for roofs. It presents high adhesion strength and flexibility, with extreme durability to temperature variations and rain. Its whiteness significantly reduces heat absorption into the roof slab. 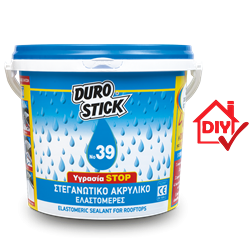 For long lasting durability, the use of SOLVENT BASED PRIMER of DUROSTICK, as surface primer is highly recommended. The primer seals in depth any possible capillary cracks and all porous sections of the roof. Alternatively, the use of the product itself, diluted with water is also suitable. Two crosswise coats of No39 are enough for the complete waterproofing of a surface for at least 5 years. Classified as product for surface protection of concrete surfaces per EN 1504-2. Consumption: 1.0-1.5kg/m2 for two coats, depending on the substrate.